Mint Controls announced this week the availability of a new professionally produced circuit board for the Port Runner Suppression System (PRSS). The board enables easy handling of thousands of IoT input sensors and output devices. It also supports a number of input devices such as cameras, near field communications (NFC), RFID, limit switches, PLCs, facial recognition, air quality devices and devices that monitor temperature, humidity, water quality and electrical quality. The new v8 circuit board will be used as a core part of Mint Controls’ service to tie in all controls offered by the company. The board can be combined with Microsoft Dynamics AX, Microsoft Dynamics NAV, Microsoft SQL Server, Microsoft 365 and Microsoft.NET programming to allow two-way communication and unprecedented capabilities. Testing on the board is complete and it has been implemented at U.S. Customs Border Patrol (CBP). The Port Runner Suppression System (PRSS) is designed to stop people from forcing their way through the border without inspection. A Customs Officer can activate the PRSS whenever they suspect that someone is attempting to run the border. Once activated, the system effectively stops traffic and allows for quick and easy apprehension of the individual. 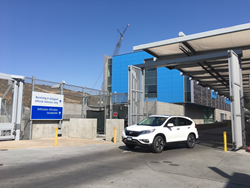 Mint Controls is subcontractor to Tigua Enterprises, Inc. who is responsible for maintenance and service of the PRSS at the U.S./Mexico border in San Ysidro, Otay Mesa and Calexico, CA. The Irvine-based company provides build to suit solutions for a wide range of industries. Mint Controls employs a full time staff of Electrical Engineers, Network Engineers, Fiber Installers, Programming Staff as well as remote and on-site staff. The company offers 24/7 support of their build to suit solutions. Mint Controls is a build to suit company with headquarters in Irvine, CA. The company offers cost-effective, smart IoT solutions to businesses of all shapes and sizes. They provide full support and maintenance of their IoT solutions. For more information about Mint Controls, please visit their website at http://www.mintcontrols.com.